From the Manufacturer It's all about connections--the CDX-GT630UI is Sony's first car stereo that can connect directly to iPod players, other digital music players and USB thumb drives. That's on top of 52 Watts high power through 4 channels, a full-featured CD player, MP3/WMA/AAC/ATRAC3 playback, AM/FM radio, and a front panel auxiliary input. For further expansion, the CDX-GT630UI is compatible with Sony's Satellite radio tuner and HD radio tuner. It's bound to become an indispensable tool in the fight against insanity during rush hour. Sony's first car stereo that can connect directly to iPod players, other digital music players and USB thumb drives. Click to enlarge. The CDX-GT630UI features a flip-down detachable faceplate with black 13-segment LCD display. Switchable blue or green key illumination makes control in the dark a snap, and lets you pick your style. Most Sony CD receivers feature a 45 degree maximum mounting angle, allowing them to be used in virtually any custom or unusual installation. The auxiliary input is built right in to the face of the head unit, so to use external devices like MP3 players, all you need to do is plug-n-play. 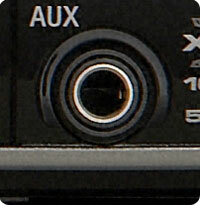 Features front panel auxiliary input. Insert a USB thumb drive in the front panel USB port and enjoy your favorite digital audio files. By connecting an iPod to the USB port, you can listen to all your favorite iPod tunes on your car speakers. Once connected, the iPod will turn on, and it'll resume where you last left off. Enjoy full control of the iPod from the CDX-GT630UI, and while the car is on, your iPod will get a charge, so it'll be ready to go when you're back on foot. The CDX-GT630UI gives you the freedom to choose your format. Whether it's burnt to disc or on your USB drive, you'll enjoy playback of MP3, WMA, AAC, and ATRAC3 formats. You also get ID3 tag support--title, artist and album info will be scrolled across the LCD. While enjoying your iPod, or USB tunes, you can give ZAPPIN a try. 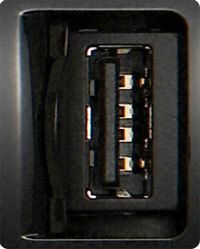 Sony's unique ZAPPIN technology operates similarly to most car stereos' scan buttons. It continues to play a series of short music clips from your own music library until you can find your favorite song to match your mood. Using separate Sony adapters you can add an HD radio tuner, or add Satellite Radio for a wealth of channels of music, news, talk shows, sports and traffic information with CD quality sound. Always have your favorite stations at hand with 18 FM and 12 AM presets. Setting your radio presets can be a real pain while you're driving--especially if you're in an unfamiliar area. So, let the tuner do the work for you by activating the Best Tuning Memory (BTM) function. The tuner will seek out up to 18 of the strongest stations in the area and set them into the tuner presets. Switch between blue and green key illumination. The CDX-GT630UI features a 24-Bit D/A converter, which oversamples the digital signal, creating a more natural sound and better imaging. Dial in your sound using Sony's EQ3 parametric equalization, with 7 presets offering a wide variety of solutions, or make individual Low/Mid/High adjustments. For more power, use the front, rear and subwoofer preamp outputs for use with external amplification. Included is an ergonomic remote to be used while watching the road. Sony CDX-GT630UI, installation hardware, manual.